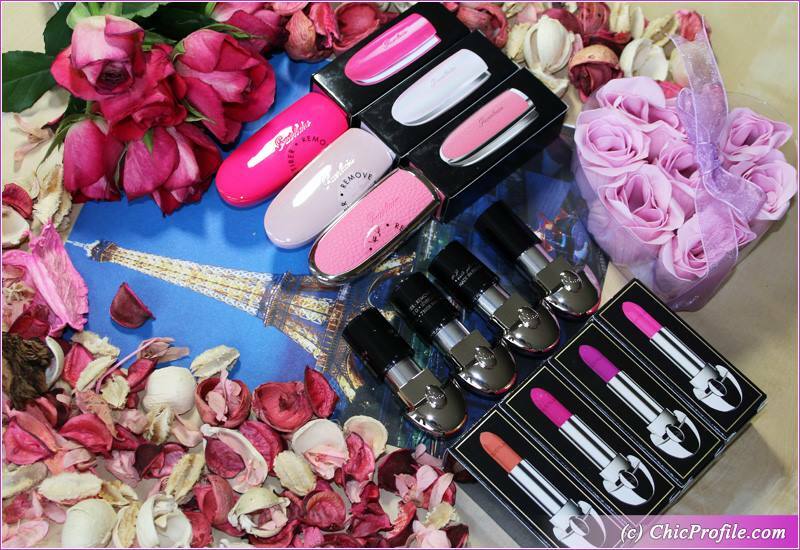 Guerlain Rouge G Lipstick has been an iconic product for years so the launch of the new Guerlain Rouge G de Guerlain Lip Colors 2018 line is heavenly for any fan of the brand or beauty junkie out there. 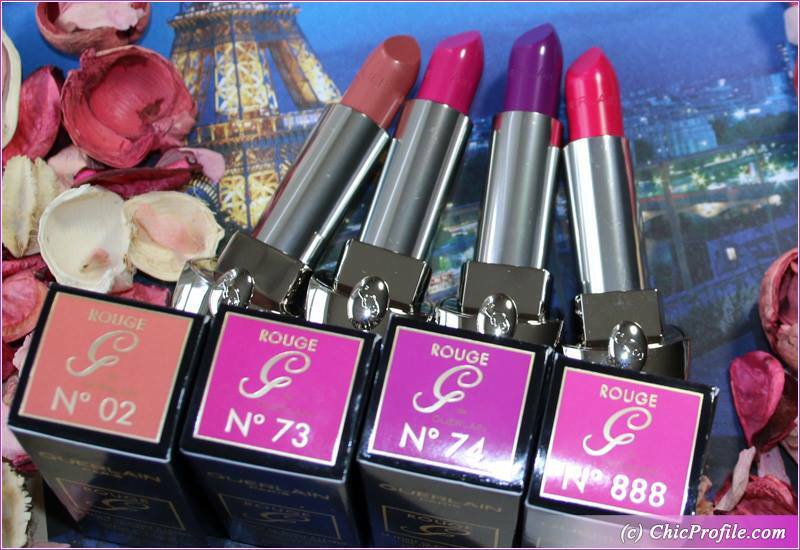 I can say with all the sincerity that Guerlain Rouge G is one of best lipsticks out there and has been so for years. But will the new Rouge G de Guerlain Lip Colors will keep this legacy? For a lipstick junkie this launch must be something they’ve been craving for long and a collection that’s worth investing as the shades are permanent. Guerlain Rouge G de Guerlain Lip Colors come in 30 shades, but the newness lies not only in the formula, but mostly in the packaging. All the lipsticks come as refills to which you can add a customizable lipstick case. You can choose between 15 lipstick cases, Miami Glam being limited edition. So you can basically buy several lipsticks and just one case that will host your lipstick when you go out. 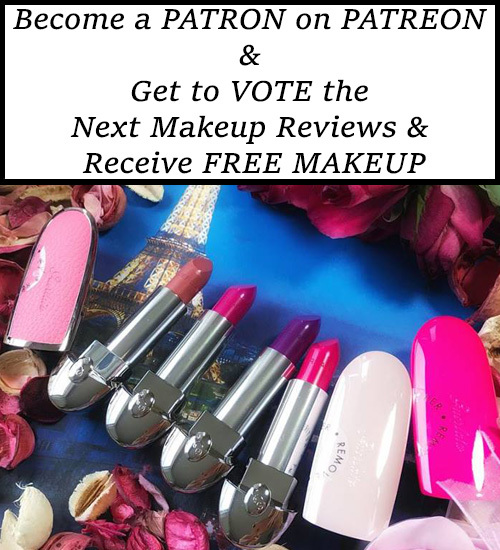 I’ve been at Guerlain counter right on the day of the launch so check out LIVE SWATCHES of Guerlain Rouge G Lipsticks 2018. Take a closer look at the beautiful lipstick cases and choose your favorites. I was surprised to see that in the store the cases retailed for 12£ while online they are sold at £14.50. Maybe I just got lucky price when I purchased these but if you can save up some money then go definitely in the store and check out the prices. 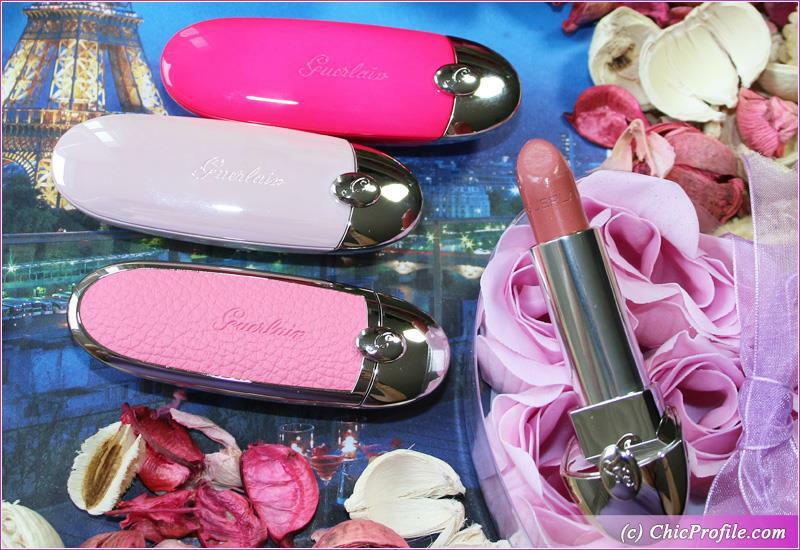 The best prices online for Guerlain are at Escentual. I bought there more shades, but we’ll talk about those in my upcoming reviews. 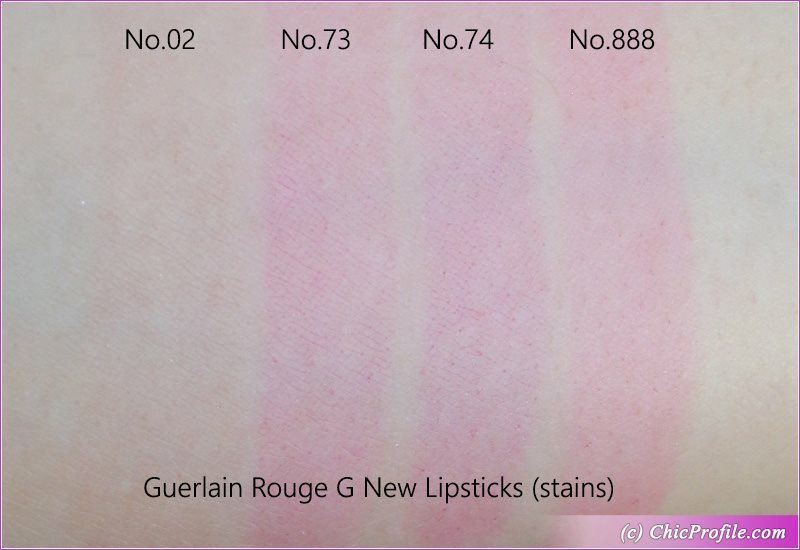 HERE you have swatches of all the new Guerlain Rouge G Lipsticks 2018 in case you didn’t make it to the store just yet. Guerlain #02 Rouge G de Guerlain Lip Color (2018) ($32.00 / £24.50 / 238.00 Lei for 0.12 oz. 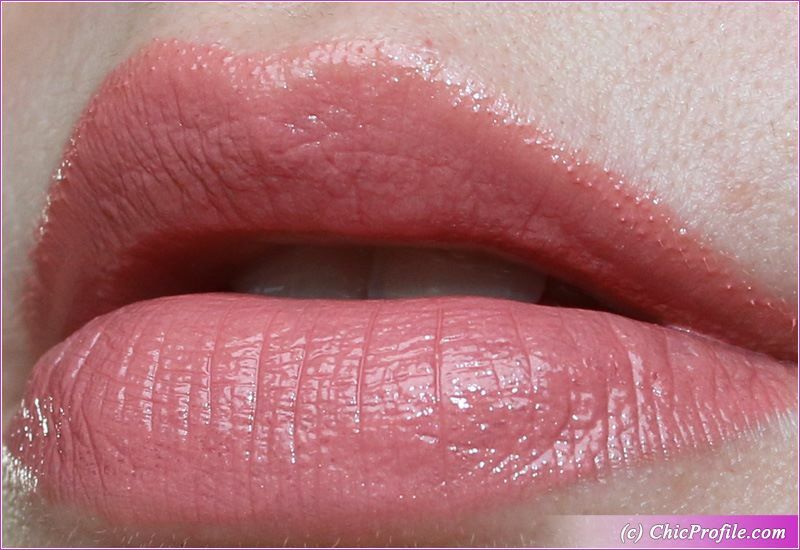 / 3.5 g) is a light medium rosy beige with warm undertones and a natural sheen. It has almost an opaque coverage in a single swipe. 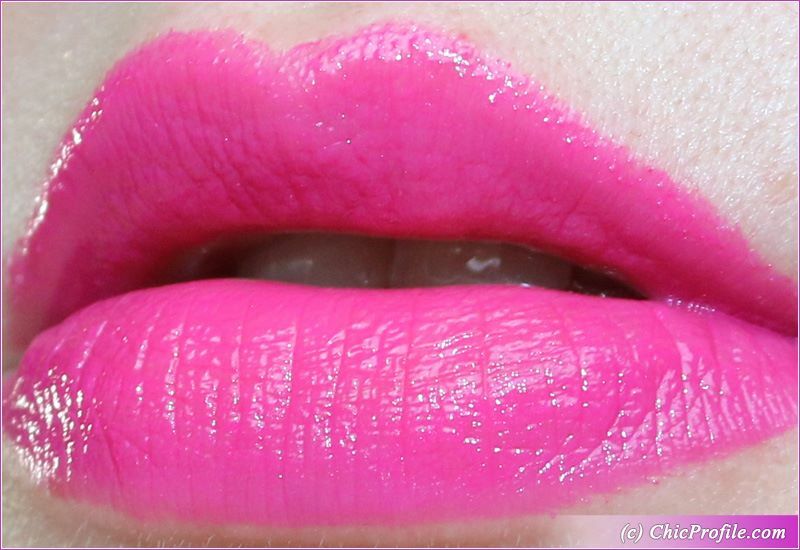 It glides across the lips easily and evenly, without tugging or emphasizing lip lines. The color should be categorized alongside neutrals and can be worn with any occasion. I see this color complementing the majority of skin tones and it would be hard to not to work on someone. Guerlain #73 Rouge G de Guerlain Lip Color (2018) ($32.00 / £24.50 / 238.00 Lei for 0.12 oz. 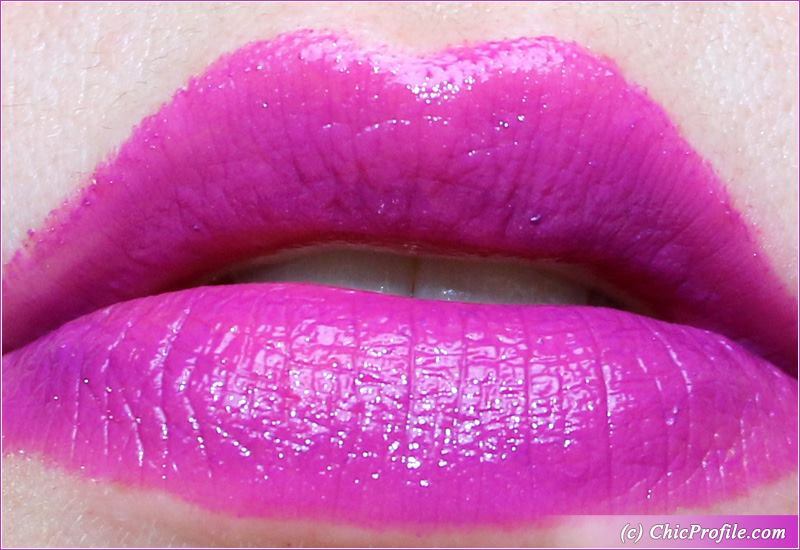 / 3.5 g) is a bright fuchsia with blue undertones and a luminous sheen. 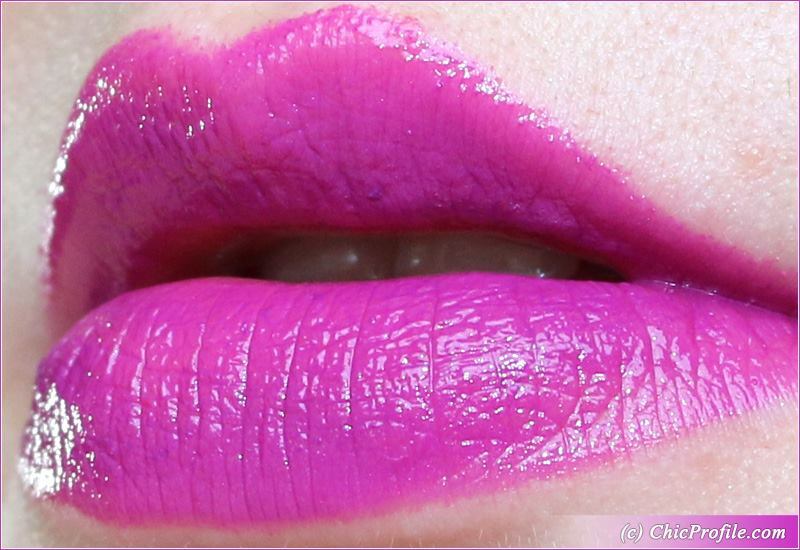 It has a good color payoff being fully opaque on the lips in one swipe. The formula feels light and hydrating on the lips. You can easily tell that this is one of my favorite shades. Guerlain #74 Rouge G de Guerlain Lip Color (2018) ($32.00 / £24.50 /238.00 Lei for 0.12 oz. / 3.5 g) is a medium-dark violet purple with blue undertones and a luminous finish. The color payoff is great coming almost fully opaque in one swipe. 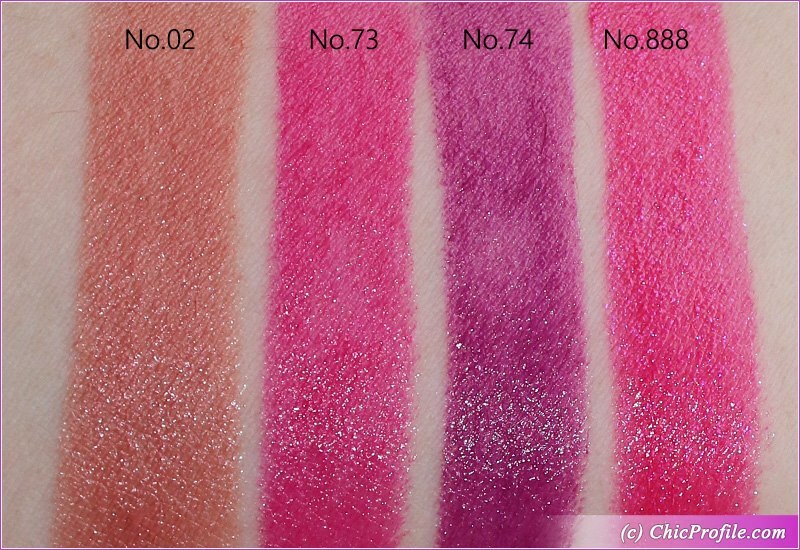 You can definitely get an opaque coverage after the second layer, but the color is so intense that you barely have to. It has the same creamy and lightweight formula that won’t settle into your lips lines. With a color like this make sure you’ll get notice and turn heads wherever you go. It’s bright and playfull, definitely complementing medium and darker skins as well. It stains the lips pretty heavily after a long-wear of six and a half hours. Guerlain #888 Rouge G de Guerlain Lip Color (2018) ($32.00 / £24.50 / 238.00 Lei for 0.12 oz. 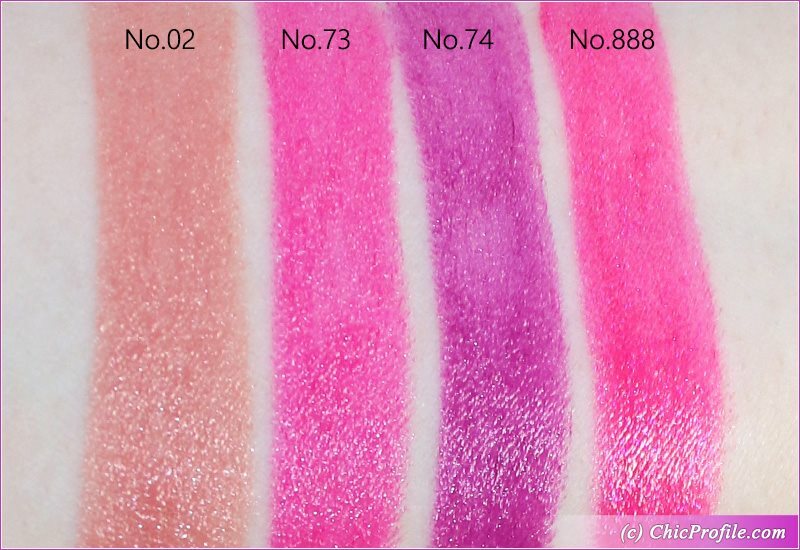 / 3.5 g) is a medium bright fuchsia with cool undertones, violet shimmer and a luminous sheen. I probably love this color the most. 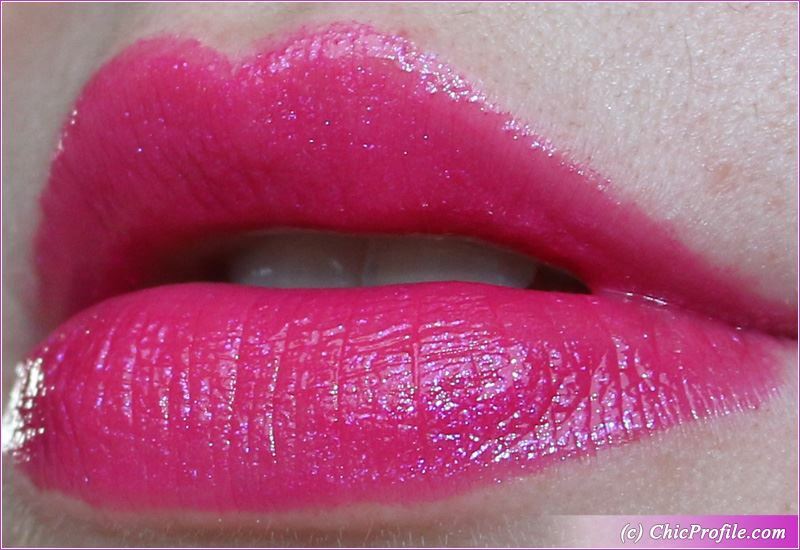 It comes almost opaque on the lips in a single layer. These violet shimmer particles just make this color shine so beautiful in daylight, whether is a sunny day or not. 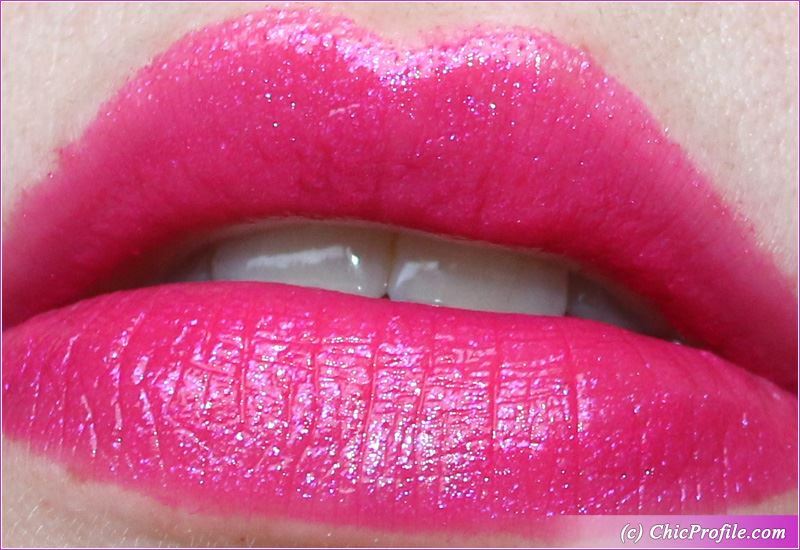 It’s a lip color that looks special, very vibrant and joyful. I would honestly see this color on almost everyone, but then again is hard to dislike pink when you are in my place. 🙂 I see it as a festive color, that can very well go with a dramatic or smoky eye look. 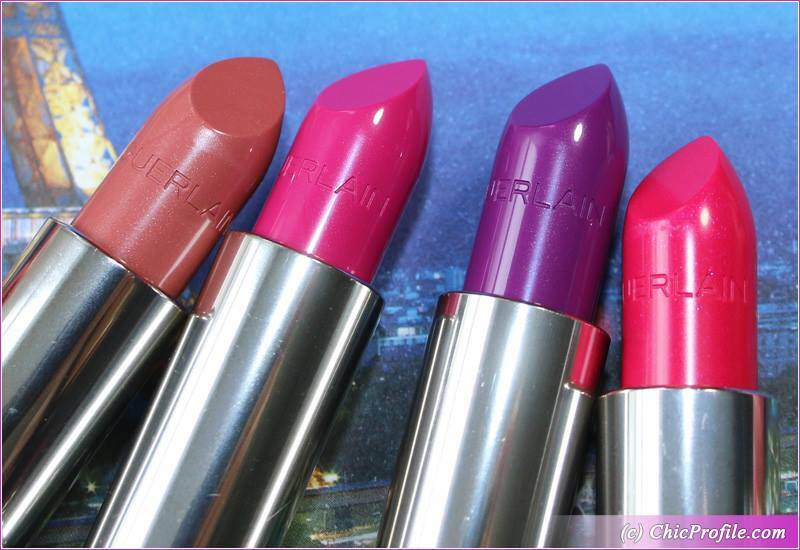 The consistency is creamy, light, slightly emollient and glides beautifully across the lips. It makes your lips appear fuller and plumped and the formula doesn’t sink into your lip lines. Just like the other hot pink and purples this one leaves quite the stain behind. 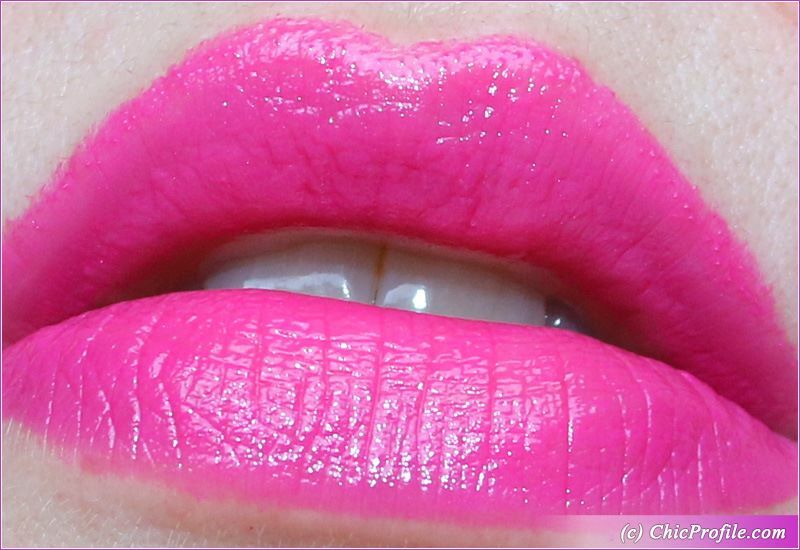 Once the color will wear off from your lips you will left with a bright pink stain that will linger a few hours more. I got an average of six hours wear and comfortable, slightly hydrating sensation. Some say that this shade is listed as a top coat, but I was presented only two toppers, the white and the yellow one. If you lay any of them on top of this shade it will bring out even more this violet pearl. 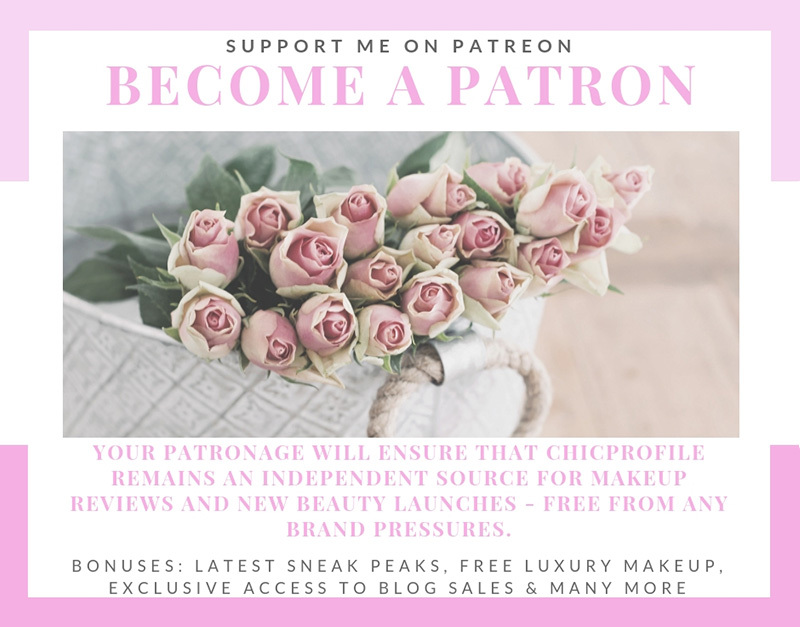 You can see it on my Instagram right here. If you are curious to see how this shade looks one me, swipe bellow for photos. It’s pure elegance, luxury and femininity combined. The cases are absolutely gorgeous, hiding two types of mirrors inside so you can get a quick retouch throughout the day. 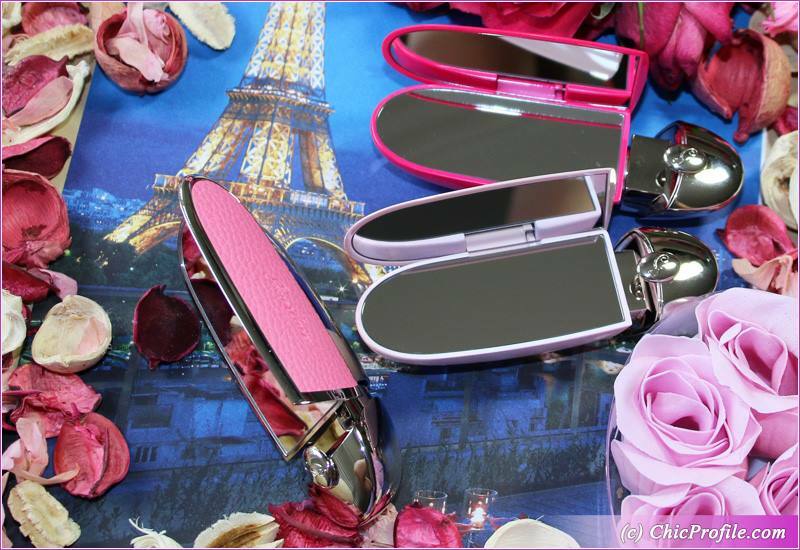 I absolutely love the small mirrors hidden inside the case as they are so handy when you are wearing a small purse or a clutch and need to save up space. The cases a bit heavy, actually heavier than a normal lipstick case, but sturdy and high quality. The fact that you can match your lipstick to your lip case is a great idea. I personally think I’ll end up buying all the cases soon. 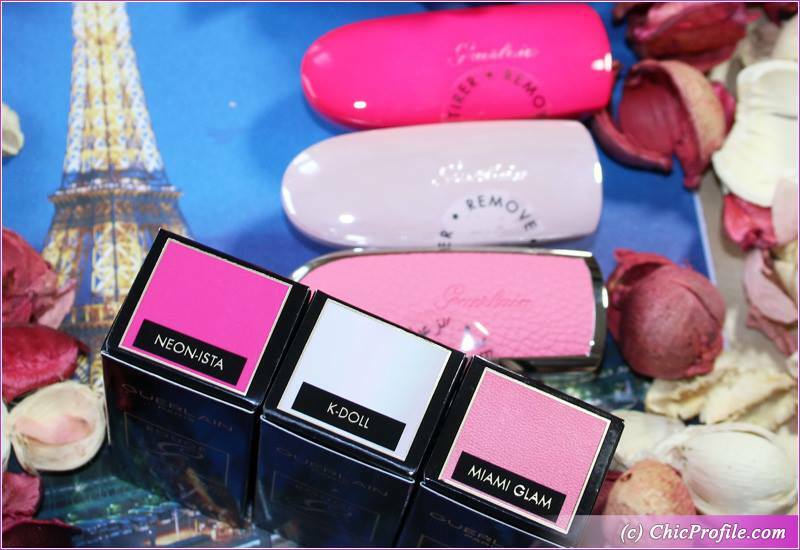 I’m definitely seeing my pink and fuchsia shades only in the pink cases, the nudes in a more classy packaging and reds in those gorgeous leather or marble-like lipstick cases. It’s totally up to your preferences, but I just like to play this mix and match game.